Celeste is a full-coverage glitter that contains mainly greens, blues, and bronzy golds. There are a few flashes of other colors here and there, which increases its versatility. I can see using this with a beachy sandy color, either as a topper or an accent nail. I thought I had this opaque in two, but the photo makes it clear I should have used three! 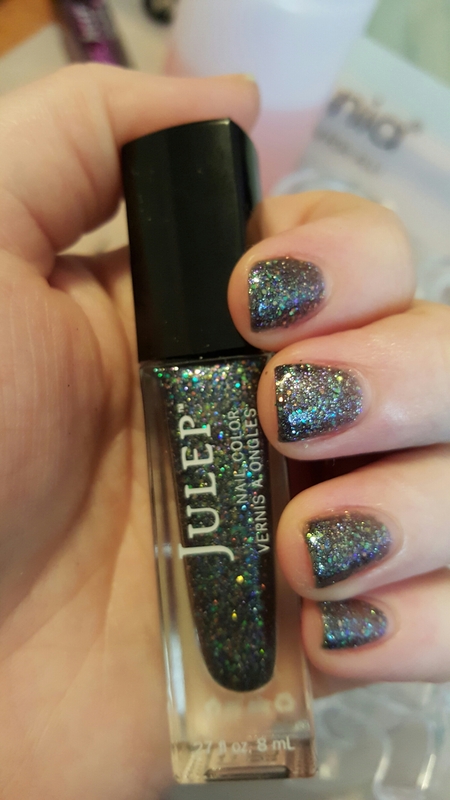 This entry was posted in Nail Polish Collection and tagged glitter, green, indie nail polish, julep, nail polish, swatch, swatches on April 12, 2016 by Mel.